Voice announcements made quick and easy. Is there a better alternative to Echoes? Is Echoes really the best app in Social Networking category? Will Echoes work good on macOS 10.13.4? 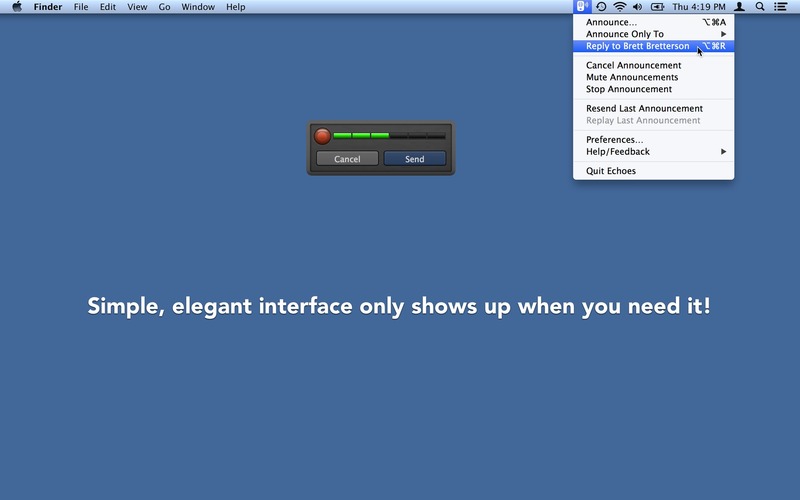 Echoes makes it easy to send quick voice announcements to other Macs running Echoes on your local network. Echoes is different from Skype, FaceTime, and other voice chat applications because it eliminates "dialing" or setting up connections with your recipients. Echoes puts an icon in your menu bar where you just choose "Announce" (or press a convenient keyboard shortcut), speak your announcement, and press return. Its fast and easy. Corrects issues with preferences and keyboard shortcuts on international keyboards. Echoes needs a review. Be the first to review this app and get the discussion started! Echoes needs a rating. Be the first to rate this app and get the discussion started!